Primary Immunodeficiency Q&A, a new series of podcasts developed by the Immune Deficiency Foundation (IDF) in the U.S., answers questions and addresses topics to help people with primary immunodeficiency diseases (PI) navigate living with these rare, chronic disorders. Each episode features a special guest, from physicians and nurses to life management experts and individuals living with PI. John G. Boyle, IDF President & CEO, hosts and leads the discussions about various issues such as health, wellness and advocating for yourself. This podcast series provides online opportunities for people around the world to learn about managing PI from the comfort of their own home. Click here to listen to the latest episodes of the Primary Immunodeficiency Q&A. Already listened and loved it? Subscribe, rate and write a review for us on iTunes! The IDF National Conference brings together the PI community every other year for a three-day conference in the U.S.—the world’s largest gathering of individuals and families living with PI. In 2019, we will gather the community in National Harbor, MD, outside of Washington, DC, June 20-22. Much like conferences in the past, IDF will have something for everyone. It will include more than 40 educational sessions that address areas of interest to anyone facing a diagnosis of PI as well as presentations and networking focused on someone’s specific diagnosis and their stage in life. From physicians to nurses to specialized life management experts, individuals and families are presented with an unsurpassed opportunity to network with those on the cutting edge of research and treatment. Whether someone has previously attended or this is their first IDF conference, there will be plenty of sessions for attendees to enjoy! 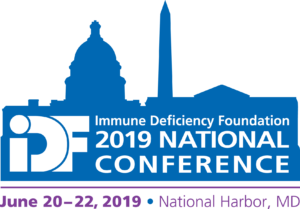 For the complete conference schedule and registration information, go to: www.idfnationalconference.org.